Putting together our Christmas mantel decorations every year is always a challenge. Because we have one of those fireplaces that serves as a dual focal point in our keeping room. There’s the beautiful stone fireplace, with flickering gas logs, a large stone hearth and mantel. And above it, a cabinet for our main television. In years past, I have made the mistake of adding too much garland to the mantel, obstructing our view of the TV and making remote channel surfing virtually impossible. This year, I kept things simple and uncluttered (for me!) 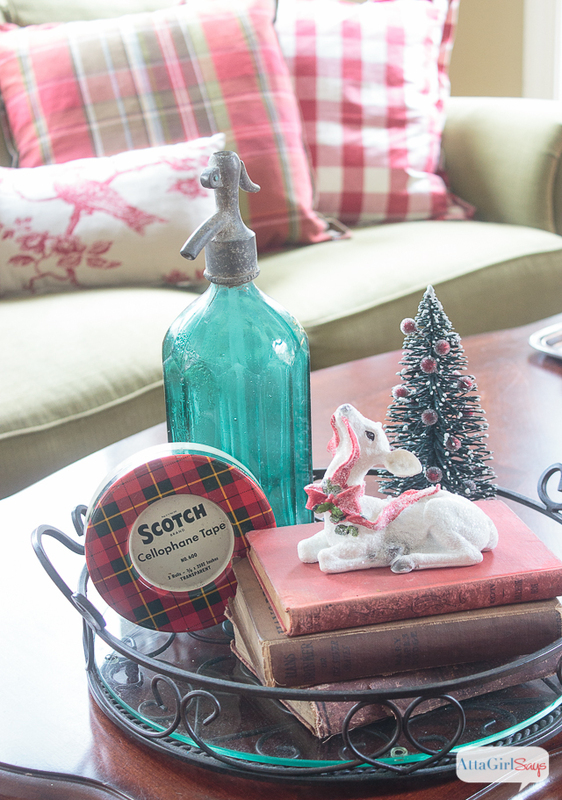 with these vintage rustic Christmas mantel decorations. I’m thrilled to be sharing them today as part of the Christmas Ideas Tour, organized by my friend Kathy at Petticoat Junktion. 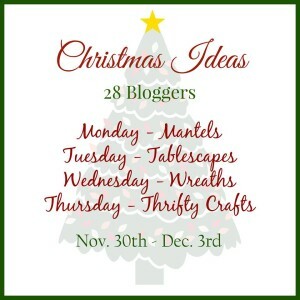 Over the next several days, 28 bloggers will be sharing our Christmas mantels, tablescapes, wreaths and thrifty crafts. You can visit them all at the end of this post. Since I can’t add much to the top of our mantel, I focus on the space below it and the fireplace hearth. I was able to add a pair of rustic owls to the top of the mantel, flanking each side of the TV cabinet. But they worked well with the red and vintage theme I’ve used to decorate the keeping room for Christmas. Here’s just a little sneak peek. Do you spy that buffalo check pattern on the sofa? I’m completely smitten. Here’s a little glimpse of the ornaments on the keeping room Christmas tree, which sits just to the left of the fireplace, nestled near the sofa. 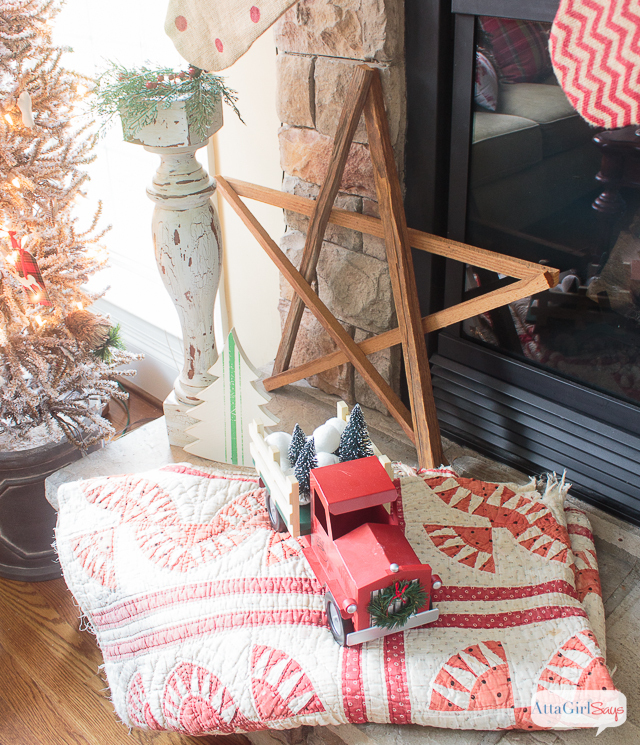 I pulled out a lot of vintage elements, like my chippy column, tobacco stick star, my mom’s quilt and a toy truck, to dress the hearth. Would you believe my mom paid $2 for that quilt at a yard sale, probably 30-something years ago? I also also added a metal bin and the snowshoes that I used on my Christmas front porch last year to the hearth. I’m really pleased with how the mantel turned out and how the keeping room, which is our main family hangout space, came together. You’ll get the see it all during my full home tour next week. Until then, I hope you’ll visit the other bloggers in the Christmas Ideas Tour. I love your mantel! 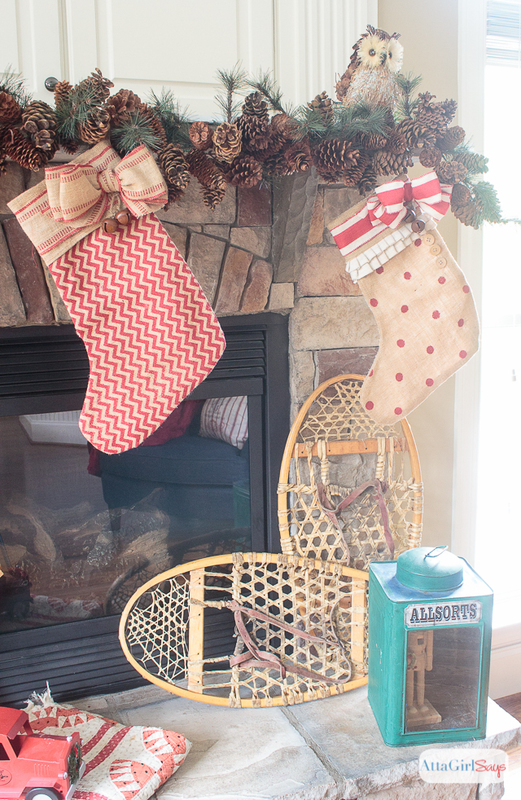 The burlap stockings are too cute and the snow shoes…… I need to find me some of those. 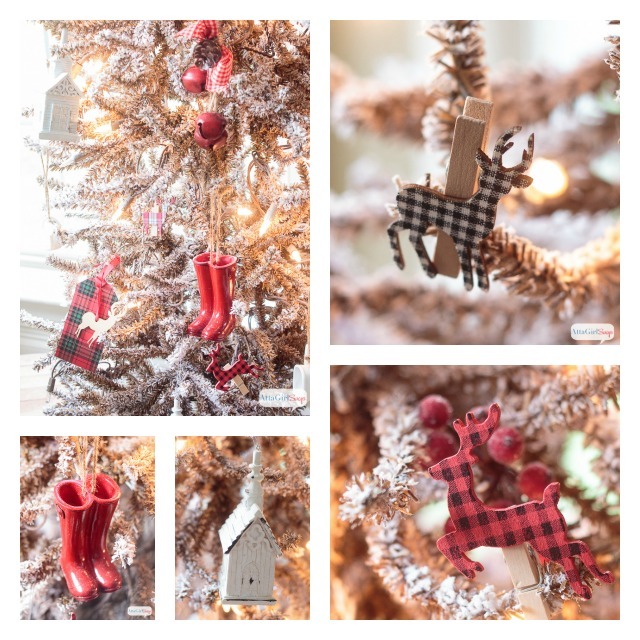 I love the pops of red everywhere and the tree is so darling! Merry Christmas!!! 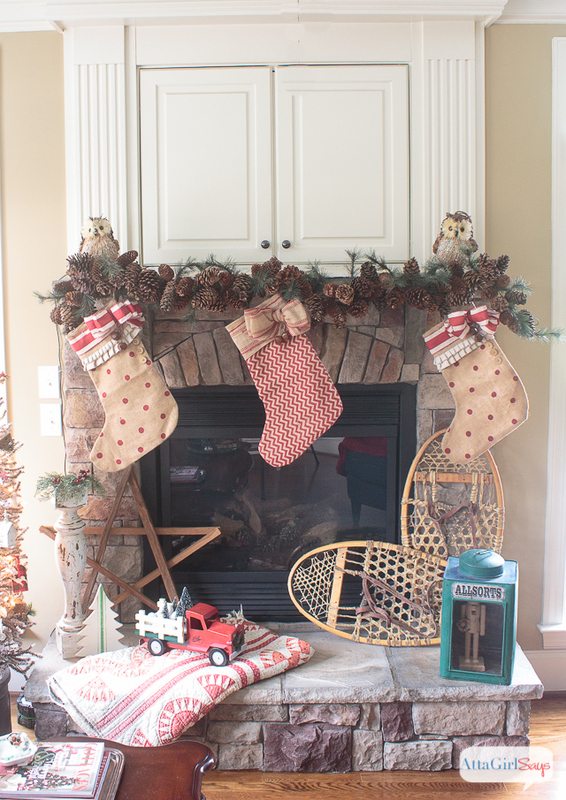 What a fun vintage mantel… love those snowshoes! 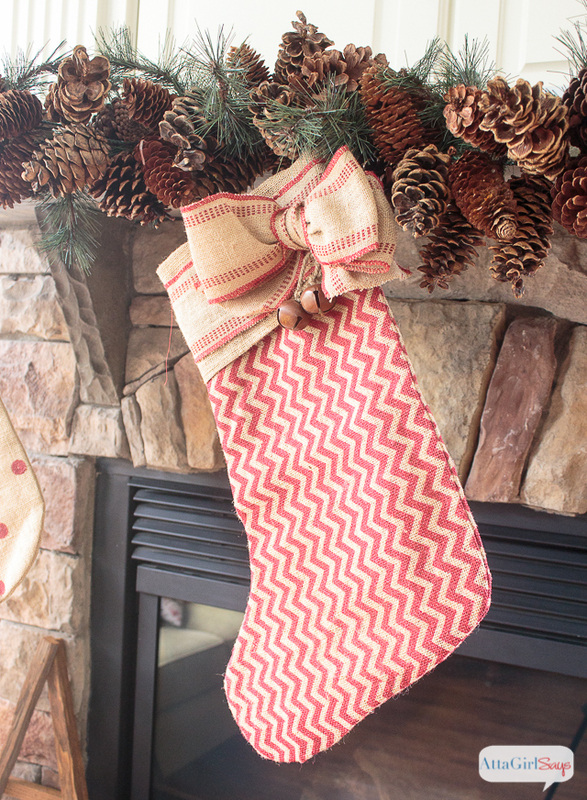 Your mantel looks so pretty this Christmas! 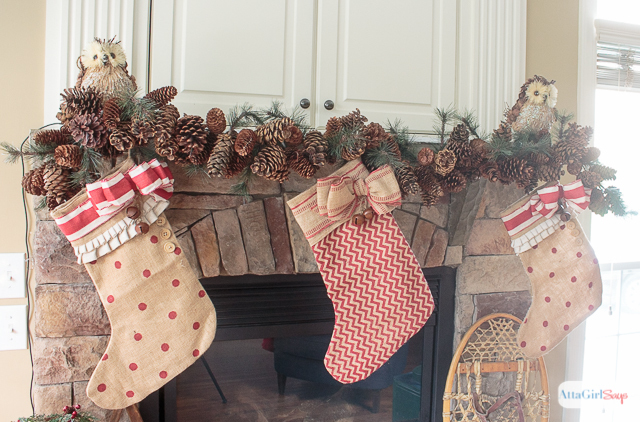 I love your burlap stockings and pretty pine cone adorned garland. I’ll have to admit that my heart did a little pitter-patter when I read that the quilt was a $2 find 30 years ago. I can picture someone lovingly making that quilt by hand and can imagine how many years it kept someone warm. Enjoy this pretty setting all of December! 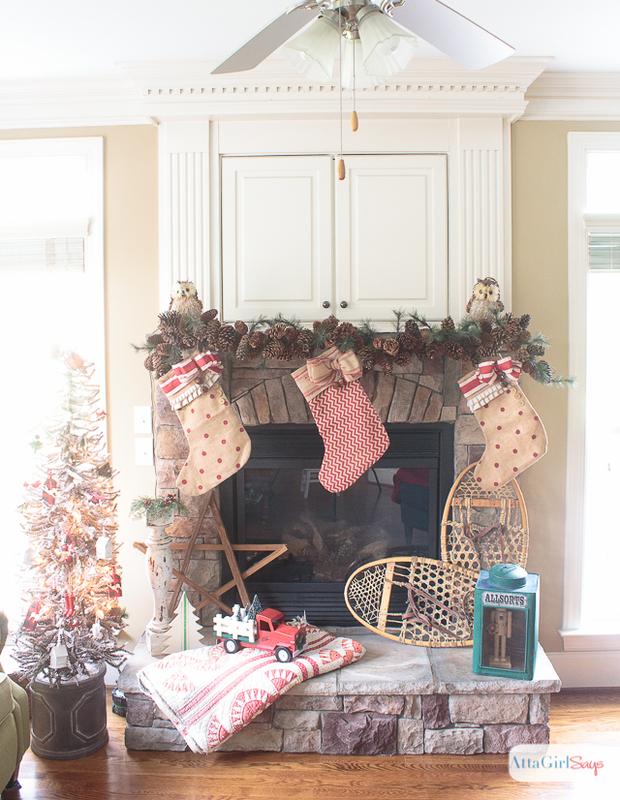 Amy, I just adore every detail that you included in your mantel decorations! 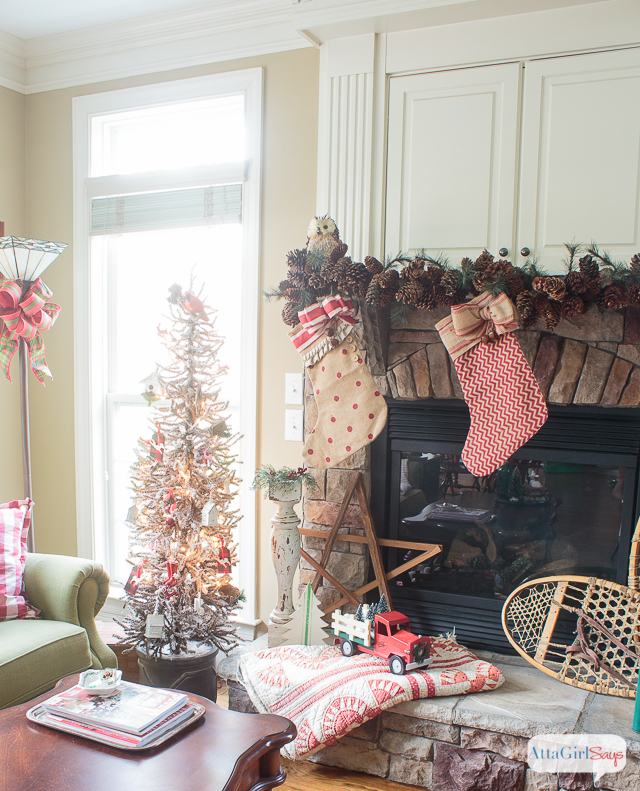 Those stocking are just darling and go so well with your other touches of red in the room. And what a deal your mom got on that quilt!!! Can’t wait to see all the rest of your decorations on your home tour! Pinning and sharing on FB! I LOVE this mantel…from that gorgeous pinecone garland to that amazing quilt!….Truly a most gorgeous rustic/vintage mantel….Great job as always Amy! 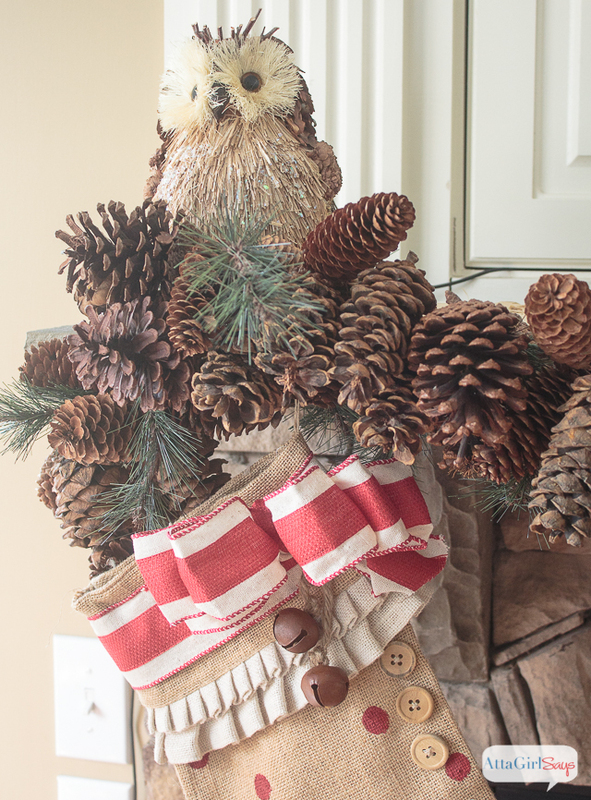 I just love the pinecone garland…it’s so warm and inviting! Your mantel is so cozy and welcoming. It makes me want to sit down and enjoy a cup of hot cocoa and listen to Christmas music. I love all of the natural and rustic elements you used. I love your mantel this year, Amy. That quilt was a steal. Gosh I wish I could find a red and white one that doesn’t cost a fortune. That truck is too cute! I love your mantel and all of the touches on the hearth and more. It’s perfectly rustic! 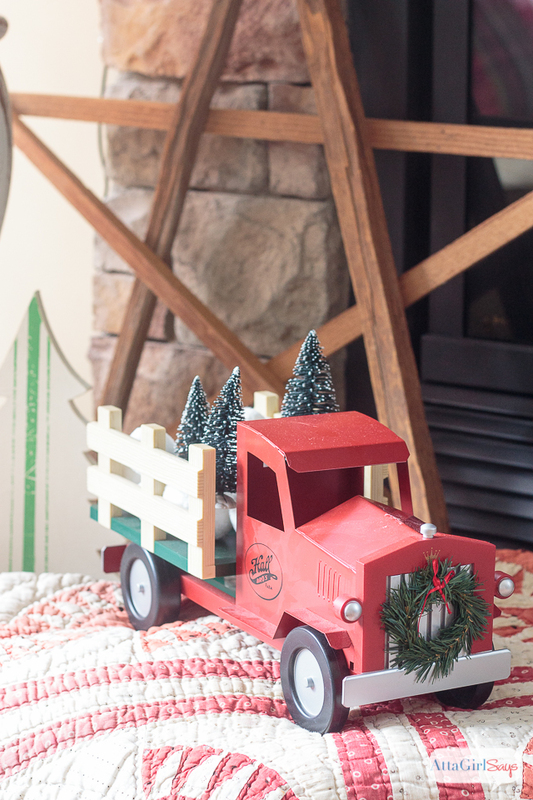 Lovely holiday décor and special touches. Happy holiday season. Thanks fro sharing at the Inspiration Spotlight party. Pinned & shared.